There’s nothing really eloquent about a game-cam is there? Not really. It’s like a redneck equivalent of the nicest camera a photographer could own. I don’t have a lot of knowledge about these little outdoor cameras personally, but my husband got one for Christmas from my Mum and Aunt and he was pretty excited. I was with them when they purchased it from Cabelas and it went down just like you would imagine. The three of us stood in the store totally uninformed as to what we were looking for and just let the very helpful salesman figure it all out for us. I am never afraid or ashamed to be honest when I don’t know something. I will tell you straight up “I have no idea what I am looking for, can you help me please?” I find that people are usually more than willing to help. In any situation in life, I really think people like being helpful and feeling like they can put their knowledge to good use by informing you of what they are good at, what they know, and try to pass that along to you. This was a good example of just that. Three ‘Fancy Ladies’ in Cabelas, not knowing much. With a few parameters, they settled on a good one, which was a Browning game camera that had all the bells and whistles. This is about the same one they got. It’s got a range of 100 feet and a 20mp shot on it. Not bad for a camo camera that gets strapped to a tree trunk. When Rob opened it up at Christmas, well, he was pretty excited. I knew he would be as he mentioned it a few times. Also, we have so many different animals making their way through our property on a regular basis, that this was going to be fun to hopefully capture them on film and see what was happening when we weren’t there. A lot of our 40 acres is heavily treed. We will most definitely keep a perimeter of tree line around all 4 edges as best we can for privacy. Our ‘back 40’ is mainly pasture land and open with rolling hills, but where we are building our house is also quite heavily treed. We will need to take a good many trees down as we develop that area yet, but we plan to keep as much as possible to start with and then landscape out as we need to. We placed the camera in an area close to our home building site where we know there are well worn deer trails. The daytime shots this little camera takes is quite impressive. We are guessing a branch fell or a bird flew past to trigger the motion detector on it as there’s no animals in this one. But at night time, oh, it’s so nice to see the friendly faces of these sweet animals who call our property home. So far we have many doe and bucks that go back and forth. We have seen them quite a bit during the day these past two years while we work there. We have seen this buck in the daytime before and he is majestic. This is a bit blurry as he must have been running pretty fast through the trail. I wish I could somehow tell them that despite the fact that we will soon be tearing down their trail and building a home in here, we will leave a ton of forest trails for them to live in. And every single one of them will be free to live at our house, safe and unharmed. No deer will be hunted on our property. By us or anyone else. I will see to that. We also have coyotes come through. I hope he’s not scoping out our chickens! Apparently, there is the odd cougar and even one black bear that neighbors have spotted, but we haven’t seen any evidence of that on our property yet. I’m kind of hoping we don’t. It would be neat to get a picture of a bear, but I’ve seen a few in real life in the wild. I’m good. 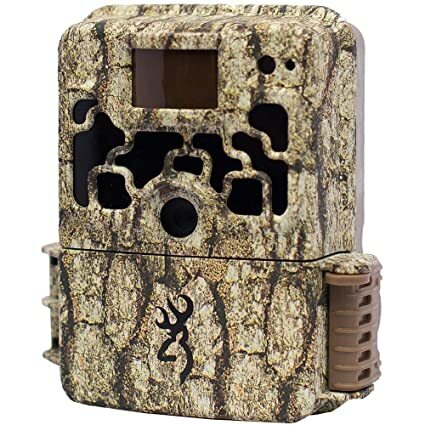 Anyway, I’m not endorsing any products here today, but Browning (a link to a million options on Amazon) really is one of the leaders in game camera technology and it was definitely a great tool for the money. It’s a great clear photo with a very sensitive motion detection on it. Strap it to a tree and let it do it’s thing. There’s no flash at night to scare the animals either, so they aren’t interrupted or frightened at all. It even caught this sweet little bunny. I feel like this is the real life set of Bambi. I think Rob worries at times that when we are finally living there I’m going to be the crazy lady constantly luring little animals into our home. It’s a real possibility for me. Oh, and please, no offense to all you sweet rednecks out there. You know who you are! I’m not making fun at all. I married one, after all. I feel you pain about the blog title. The name of my beekeeping company is Deerstalker Apiaries. Most people assume I am an avid hunter, which I think helps make the name more relatable to my readers. However, it is actually named after the hat that Sherlock Holmes wears and is a reference to the Doyle book, “His Final Bow” in which Sherlock retires and becomes a beekeeper. The title had me laughing. I’m sure I would enjoy that “toy” as much as you are enjoying it. The pics are great…loved the one of the buck..very awesome…yes…no guns on the property!! Wow. That was absolutely beautiful. I loved the part where you said we didn’t know anything in the store about the cam. Your mum acted like she knew. Lol!! Yup!!! Three girls in a store knowing diddly squat. How true!! those chickens secure. Judah won’t be happy if Tic Tac goes missing.